"Blue" BD gift done; on to another lovely project - may take a bit more time. 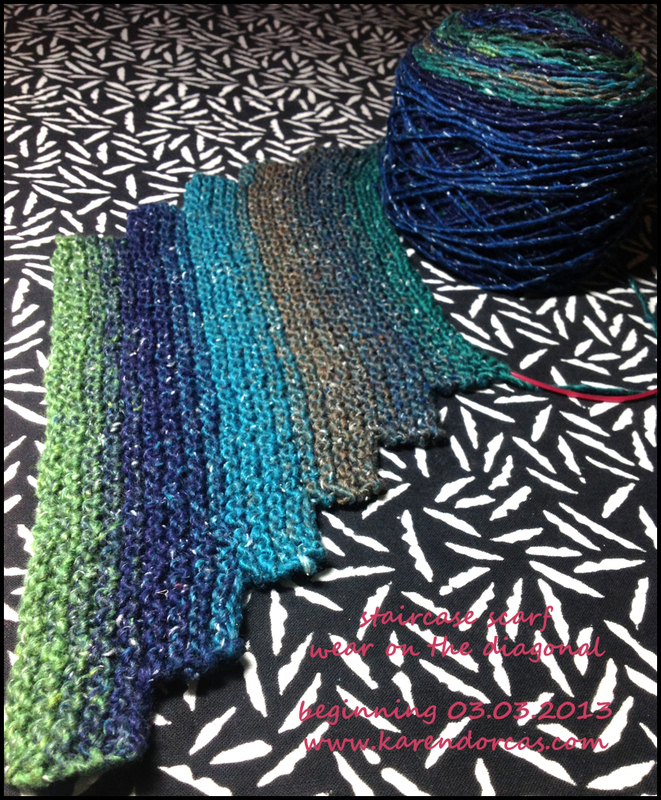 It is called "diagonal staircase scarf," 6"w x 60"l (or approximately, depending on one's height). It is on size 7 needles and one gains 1.5" every eight rows, each of 44 stitches. Can you tell I am counting toward the 15,000 stitches I will be doing? LOL - The yarn is 65% cotton, 30% rayon, and 5% silk - a very soft touch. Hi Karen, what lovely yarns! Interesting pattern that stair step scarf... I love the colors in the yarn, very soothing! Thanks for the email on the binding technique! Ohhhhhhhh - I love this! How fast you are on the needles, gal! Hats - scarves - you ROCK!!! Great cowl! I love your new stair step scarf. It's turning out so pretty. The yarn sounds really nice and soft. Happy knitting!